Overall, we received a response from 8.6% of survey recipients. Of those, 19.7% indicated they intended to pre-plan within the next 3 months while 80.3% indicated they did not intend to do so. 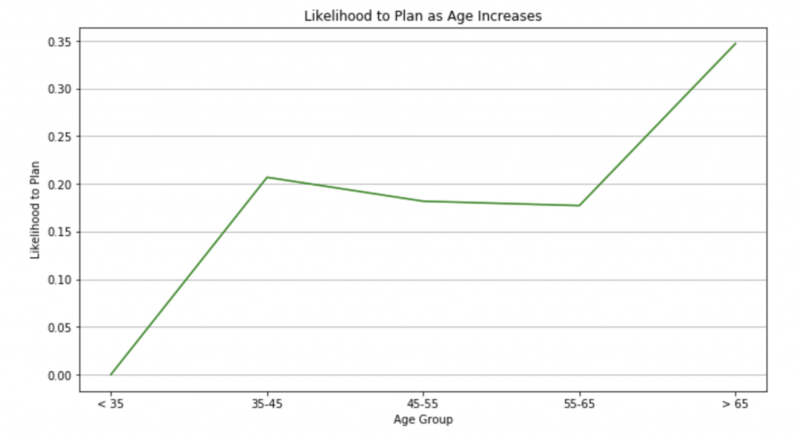 There was a strong correlation between the recipient’s age and their intent to pre-plan. The older the recipient, the more likely they were to plan ahead, with 35% of survey respondents 65 and older indicating they intend to pre-plan. Among people who indicated they do not intend to pre-plan over the following 3 months, they reasons for not doing so varied. Given the relatively high percent of survey respondents who indicated they do intend to pre-plan in the near future, it shows how critical it is for your firm to generate the leads regardless of their position on the Contacts Continuum and nurture them over time until they are ready to act. Each of the reasons for not planning ahead are easily addressable with relevant education as part of your follow up nurturing process. For instance, if someone doesn’t intend to plan ahead due to the cost, you can educate them on decisions they can begin making without any actual payment – or even provide education about different financing options. By nurturing these people with relevant follow ups, you can actually turn them from a No to a Yes!